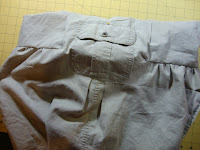 Bethany Sew-and-Sew: Avant-Garde Skirt made from Men's Shirt #2--Tutorial! 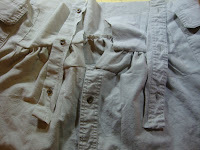 Avant-Garde Skirt made from Men's Shirt #2--Tutorial! My last post was a more funky skirt made from a men's shirt, so this time I decided to make a more traditional, yet still unique, skirt from another one of my husband's old shirts. 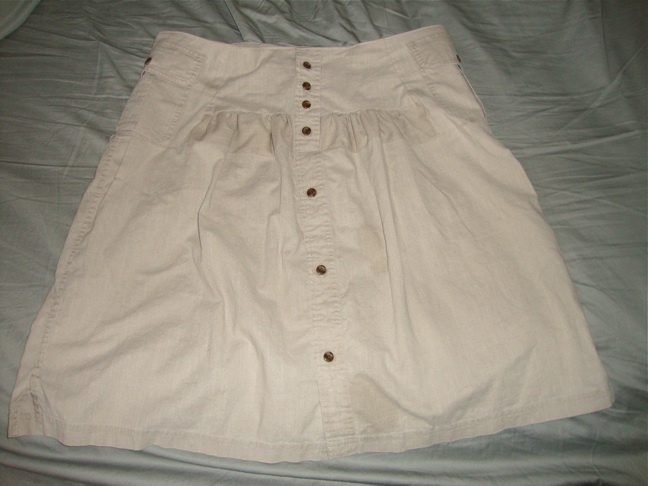 This skirt was made from an XXL short-sleeved khaki button down shirt. 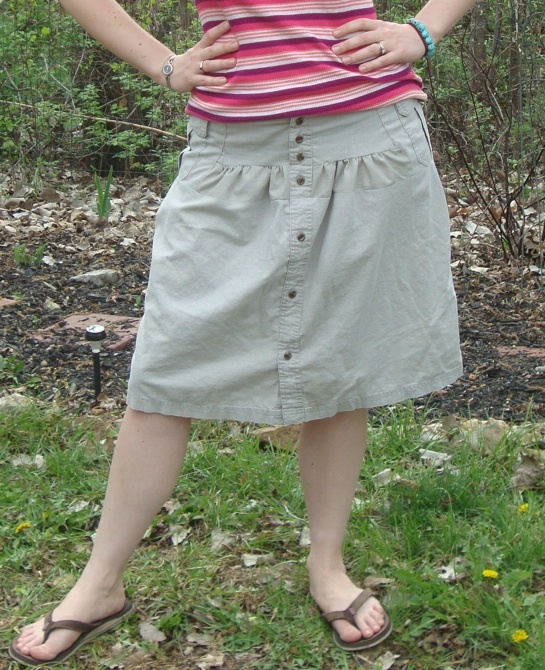 Unlike the other skirt I made, this one was made entirely from one shirt, but is similar in that it is super comfortable and wearable. There are a lot of steps, but that doesn't mean it's a difficult project. 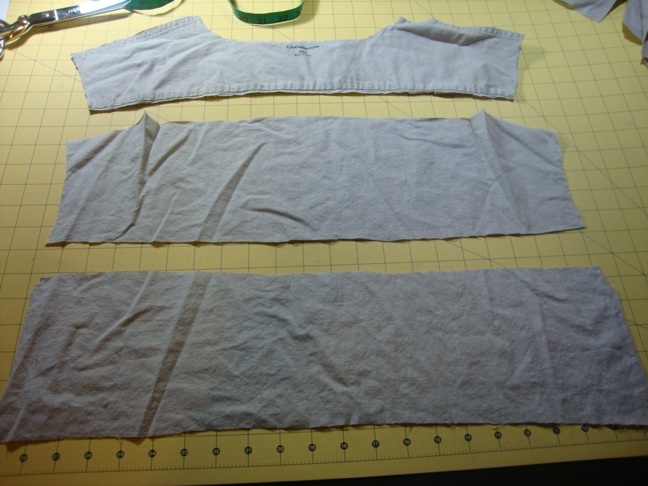 A lot of the steps are only necessary because you have to be creative with your fabric when you're limited to one shirt. 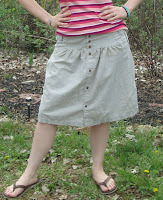 I love these skirts! 2. 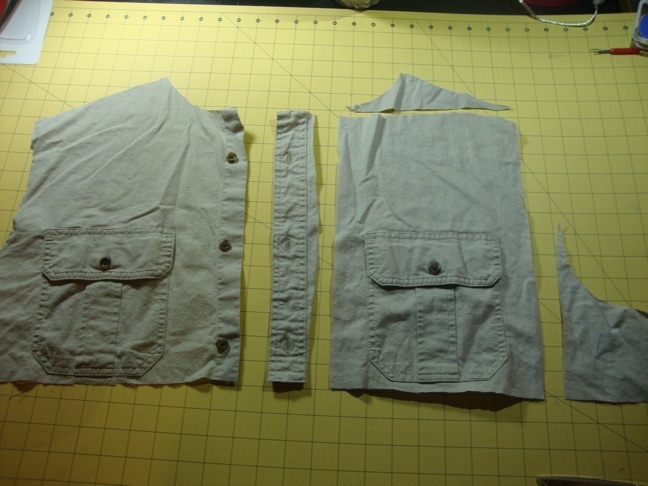 Cut off the sleeves and collar. Don't throw away these items though--you'll use them later. 3. 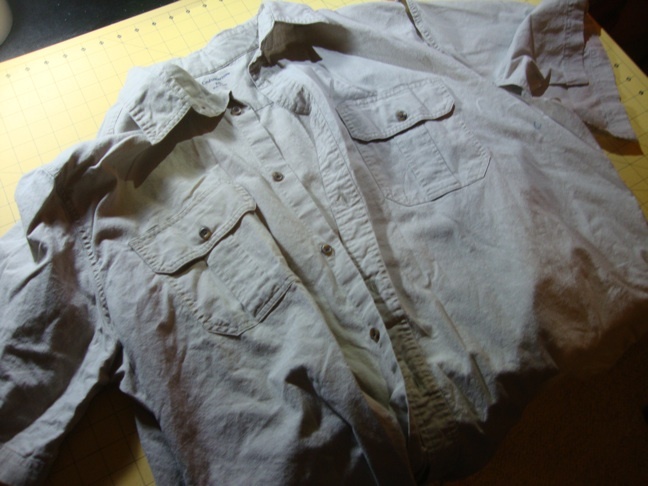 Cut the shirt in half right below the chest pockets. This is the body of your skirt. 4. 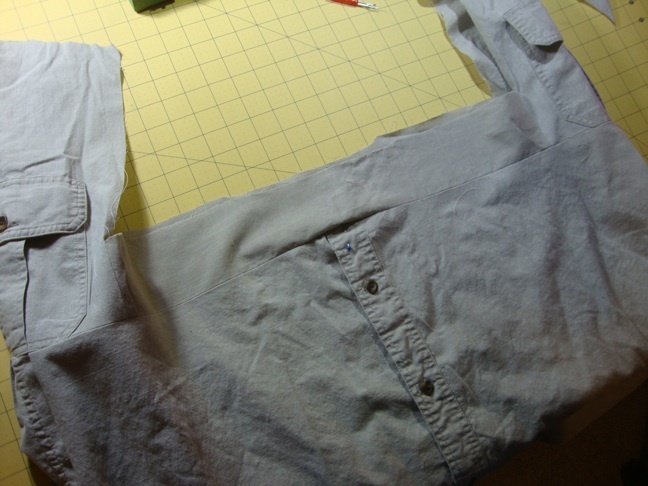 Cut the front from the back of the top half of the shirt. Then cut a rectangle from each half of the front of the shirt by removing the buttons/buttonholes (leave a little fabric on the edges of your button plackets so you can use them later in step 14), and straightening up the top and outside edges. This picture shows one rectangle cut out and one half still waiting to be cut. 5. 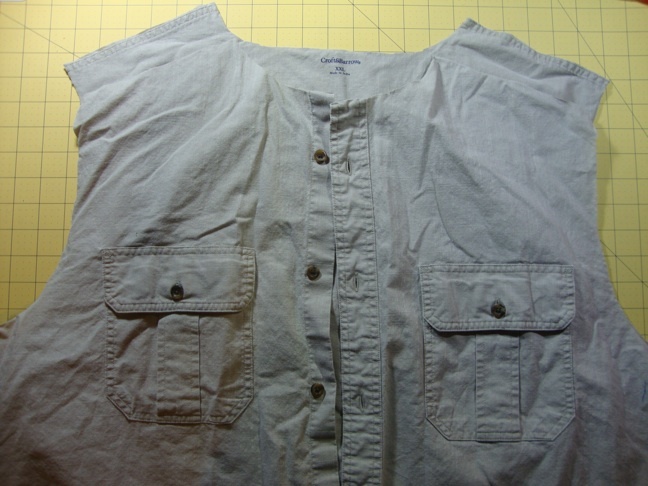 Cut the back of the shirt as shown in this picture, cutting just below the yoke, then evenly splitting the remainder of the shirt. 6. Cut the shoulder seams from the yoke, and then split it in half. 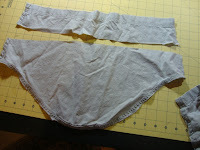 This will give you two sections of fabric. Straighten these out into rectangles as best as you can. 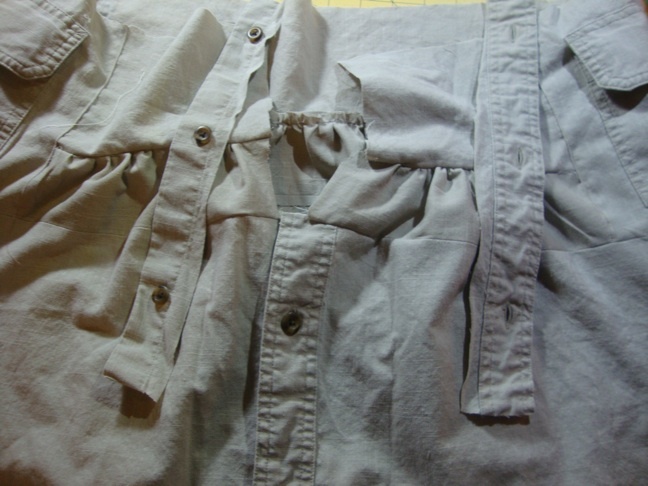 The outside of the yoke may be lighter than the inside due to fading, so keep that in mind when deciding which side will face out on your skirt. I chose to put the slightly darker edge outside for the subtle effect it caused. 7. 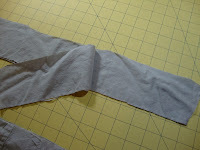 Sew the strips you cut from the yoke to the bottom edges of the pocket rectangles you cut, forming a band consisting of fabric strip-pocket-fabric strip-pocket. 8. Pin this band to the top of the body of your skirt (the bottom half of the shirt). This is where it gets interesting. 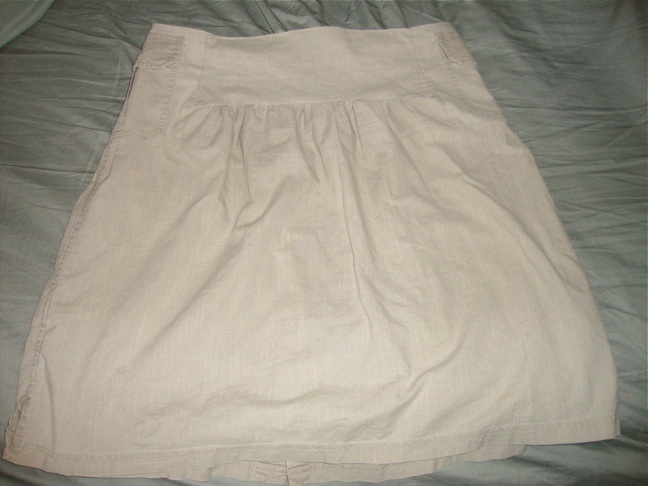 Depending on the size of shirt, the length of the yoke, etc..., this may fit exactly, or the band may be a bit smaller than your skirt. 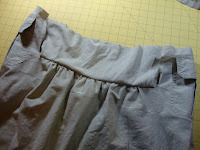 If so, gather or pleat the skirt to fit. I placed two small pleats on each side under the pockets. 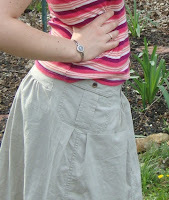 You can see these in the side shot of me wearing the skirt at the bottom of this post. 9. Sew the band to the skirt. When you lift it up it will look like this. Weird. We'll fill in the gaps though, don't worry! 10. 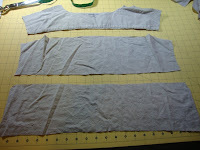 Get the other two strips you cut out of the back of the shirt in step 5. 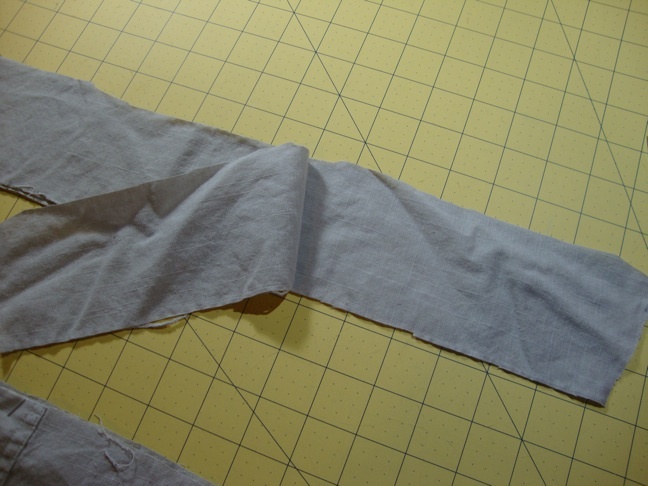 Measure above your hips (or where you want the skirt to sit), and then cut those strips, including seam allowance, to that measurement. Sew them together to form a band. This band will be smaller than the circumference of the skirt. Gather the top of your skirt between the pockets, in front and back, to fit this new band. 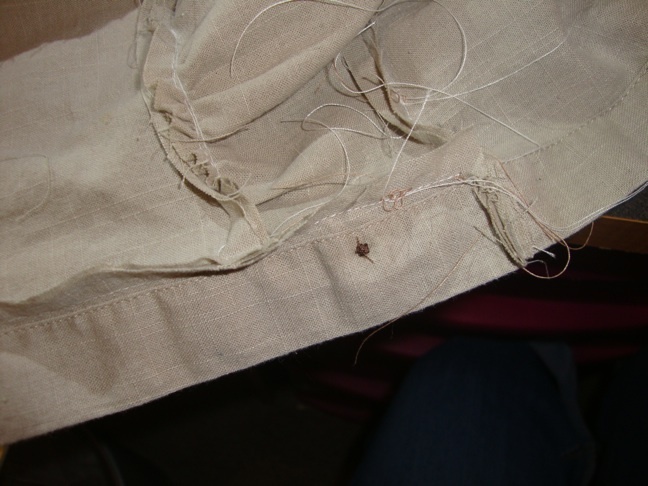 This picture shows the band already sewn in. 11. 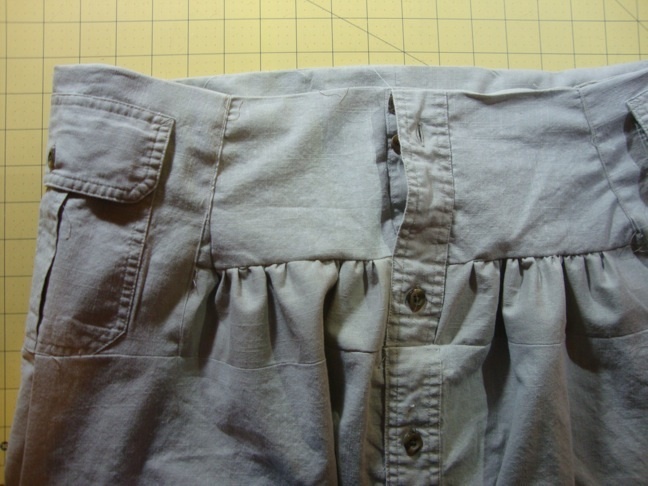 Fold down the pockets towards the outside of the skirt to get them out of the way. 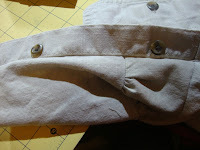 Pin the band to the skirt, right-sides together (except over the folded down pocket--see illustration). 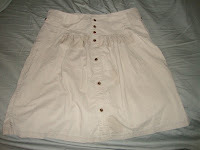 Sew the band to the top of the skirt once it's gathered to fit. Do not sew this band to the pockets. Skip over them. The band will go behind the pockets. 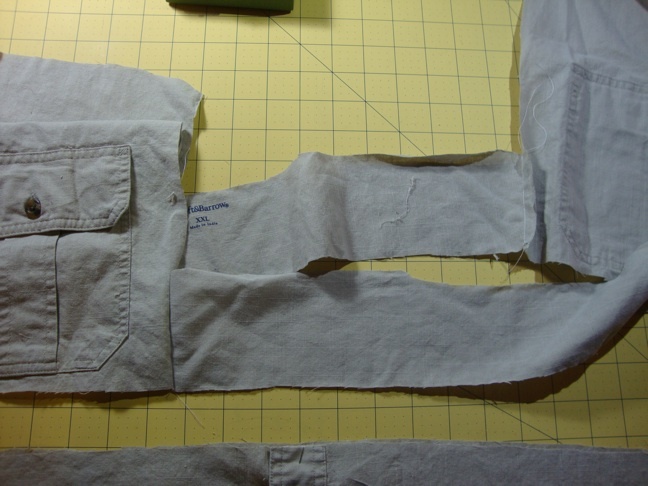 You could cut down your strips and sew them to the edges of the pocket pieces, or a variety of other ways, but I found my method to be easier. 12. Flip up the pockets and being careful to fold under the raw edges on each side of them, pin them down to the top band. Top stitch them in place. If your waistband doesn't fit as nicely as you want, tuck darts behind the pockets before you sew them down. 13. You're almost done! Now we have to make a "fly" so you can get this thing on. 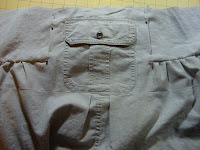 Cut the skirt open above the existing buttons. 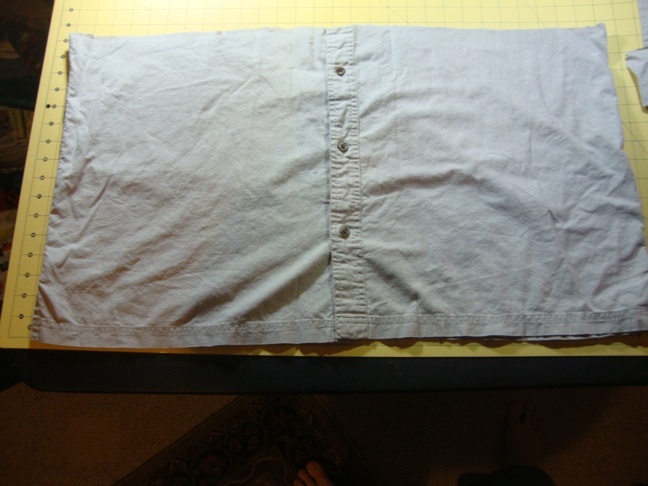 The button plackets from the top of the shirt are laying on the skirt in this picture because I'm going to use them in the next step. 14. Get the button plackets you cut off the top halves of the shirt in step 4. 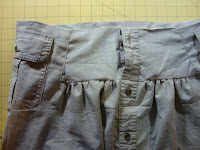 Sew them to the raw seams at the top of where the buttons/buttonholes stop on your skirt. 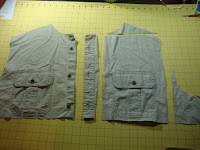 Measure these to ensure that the buttons and buttonholes will line up once your done! 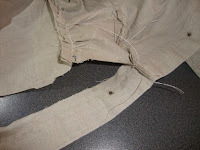 Then sew them up the remaining raw edge of the skirt. 15. 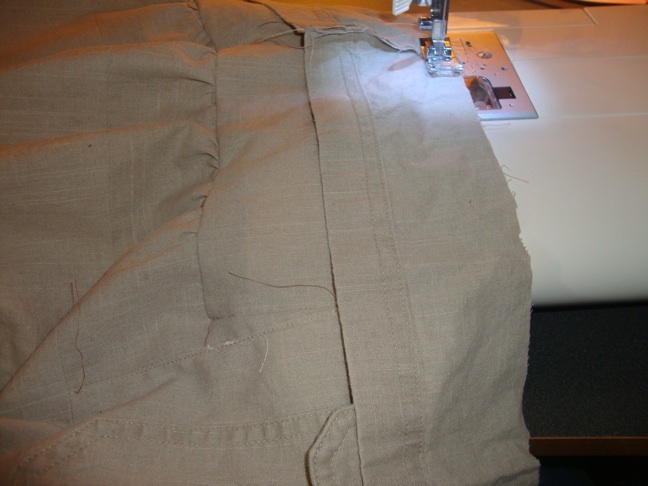 Button the skirt closed, then sew it shut up until wherever you want the fly to start. For me that's about 6"-ish from the top. 16. Now for the waistband facing. 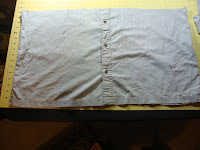 You don't have to finish the top edge of your skirt this way, but I think it makes for a much cleaner edge. 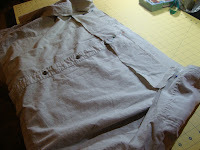 I cut the bottom seams off the sleeves to get the fabric for this. 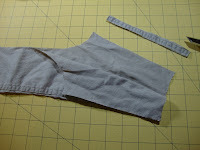 You'll need a strip as long as the top of your skirt, so you may need to cut some from the rest of the sleeves or the collar and piece it all together to make it work. I like using the sleeve edges because it's already nice and hemmed! 17. Sew the facing strip to the top of the skirt, right-sides together, all the way around, from one front opening of the skirt to the other. 18. Fold the facing into the skirt, press, then top stitch all the way around. 19. 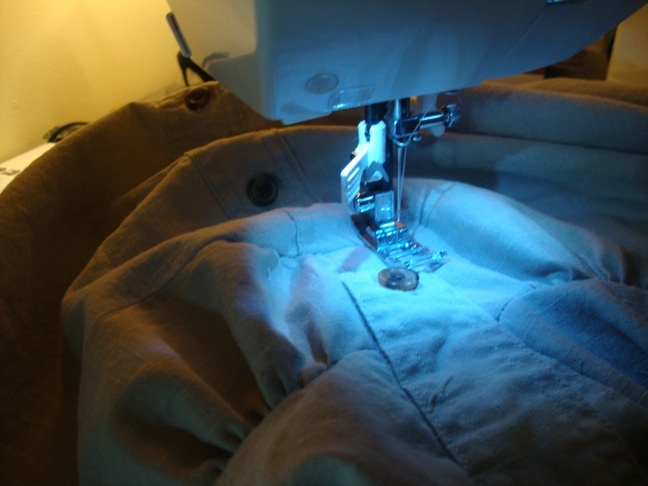 The finishing touches are to add extra buttons and buttonholes to the top if you are uncomfortable with the distance between the existing buttons, and since my skirt didn't end with a button at the very top, I added a hook and eye there. 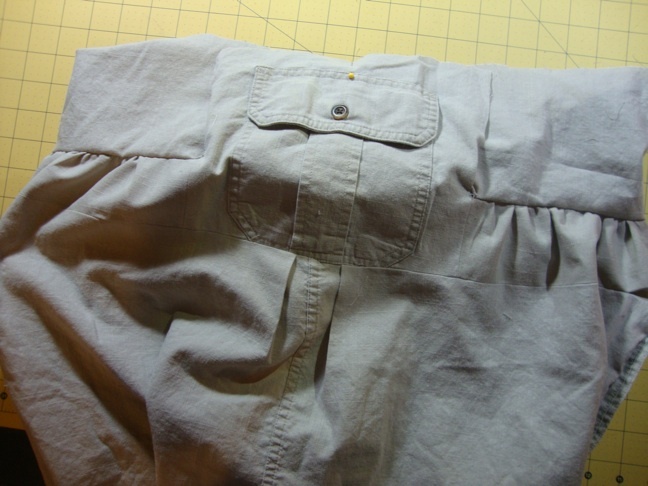 Notice the pleats under the side pocket that I mentioned in step 8.